that was OK, but why not upgrade it? 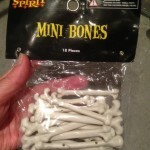 I went to the Halloween store (Spirit Halloween) and purchased two packages of small bones for $3.00 each. I then used my Ghiradelli chocolate used for melting and once I affixed the small marshmallows to either end of the bones, dipped them in chocolate. 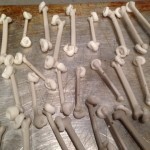 bones with the marshmallows attached. You can see I basically pushed the marshmallows on the ends, which were helpfully curled. you have to be fast about this, because they start to harden, and you want the chocolate on before they turn crusty! ave a game that kids, or raucous adults can play–as in, eat the marshmallow off the line first without it falling to the ground. (I’d recommend you confiscating iphones before you do this however. It gets pretty silly). Refrigerate (on parchment paper) because the chocolate will stick to a regular pan. 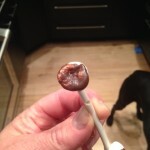 Even then, be careful when you lift it off, because the chocolate/marshmallow may slide right off the bone. This happened probably 10% of the time so it wasn’t big deal. Store in an airtight container for up to 3 days. Beyond that they taste stale.